You’re a sucker for strays. Actually, all kinds of animals have you chasing after them—or they may be chasing after you, only to come plop down on your lap. You’re like a total animal whisperer. You can’t help it; your heart breaks when you hear about a sick pet, and you wish there was something you could do for them. Animals are your people, and there’s nothing else in this world you can think of doing other than working in a place where your patients are furry (or scaly). A career as a vet technician is the right move for you, and here’s how you go about becoming one. Vet technicians are certified to provide many duties within an animal hospital, animal shelter, or any other place where four-legged friends and veterinarians hang out. They handle and care for the animals and are the right-hand person to the vet. The only things that vet techs are not authorized to do are perform surgeries, make diagnoses, and prescribe medications. Vet techs to a veterinarian are very much like nurses are to a doctor. In fact, there are many parallels between vet techs and RNs. Vet techs are usually trained to work with a variety of animal species and can choose to specialize in areas such as animal behavior, equine vet technology, zoo veterinarian technology, and critical care for animals. There are three levels: veterinary assistant, veterinary technician, and certified veterinary technician. Vet Assistant: A vet assistant works under the authority of a veterinarian, vet tech, or vet scientist, caring for the animals during routine procedures. Certificates are available, although many learn through hands-on training. The average salary of a vet assistant is a bit over $24K annually. Vet Tech: Vet tech go through a two- or four-year accredited program to earn their associate’s or bachelor’s degrees, which allows them to assist the veterinarian during all types of procedures, from routine check ups through surgeries. Certified Vet Technician: A certified vet technician has the same training as a vet tech. The difference is, he or she passed the credentialing exam and must take continuing education courses to keep it valid. Is A Vet Tech Career For You? Never the same day twice. Every day will bring in a different animal with a different reason for the vet visit. The amount of information you’ll be taking in will be limitless. You’re in a career that is high demand in a growing field. Which means, you should be able to find a job—and one that keeps you growing in the profession. You’re not restricted to just a veterinary hospital; you can find work in other places where veterinarians are needed, like the zoo, wildlife preservations, animal clinics, and research facilities, to name a few. You get to help the humans learn to take better care of their pets. That way, you know your new buddies are being well-cared for. And you’ll be helping to strengthen the bond between the animal and pet parent. Not everyone gets to work in a field he or she is passionate about. Being a vet tech probably means you love animals, and helping to take care of them is fulfilling. You won’t really experience the same day twice, which is nice because it won’t ever get boring. Sure, there will be “down times,” but your veterinarian will probably give you some administration stuff do during that time. In as little as two years, you can find yourself working as a vet tech. If you’re still in high school, take all the sciences and math humanly possible; it will help you when you get immersed in your vet tech program. Once you graduate high school or get a GED, you’ll enroll in one of over 230 American Veterinary Medical Association accredited program through your community college, where you’ll enjoy classes such as basic animal nursing care, training in anesthesia, animal anatomy and physiology, animal diseases, surgical nursing for animals, and the list goes on. There are over 20 accredited bachelor’s degree programs, but that is a far less common route than the associate’s degree. The benefit is that you can earn a larger salary than associate degree colleagues. 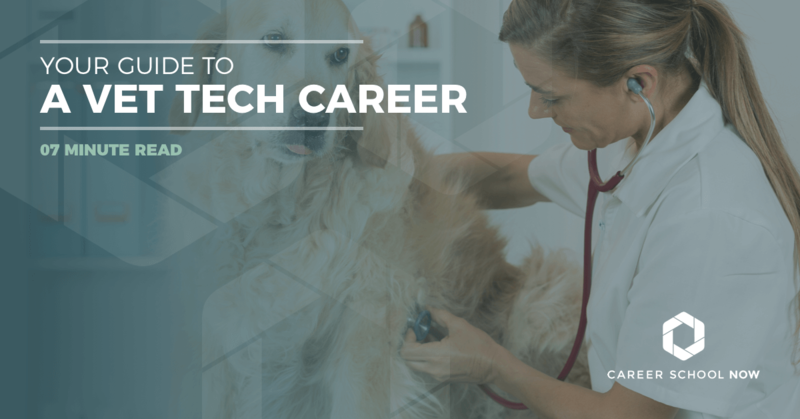 However, you also will have more responsibilities to go along with that, because you’re considered a veterinary technologist as opposed to a technician. Whether you go to school for an associate’s or bachelor’s, you’ll have to take the VTNE, given by the American Association of Veterinary State Board, once you’ve completed your education. Most states will require their technicians and technologists to be board certified, but each state has its own set of qualifications, so it’s best to check with your board. The VTNE is given a few times throughout the year, and the fee is $315. Your state will decide if you’re eligible, and you’ll be sent to the website to register for the exam. It is a computer-based, 200 question multiple choice exam, with 25 additional pilot questions that do not go toward your final score. The seven domains you’ll be tested on are: animal care and nursing, surgical prep and assisting, anesthesia and analgesia, lab procedures, pharmacy and pharmacology, dentistry, and diagnostic imaging. You’ll have three hours to complete this exam, and you’ll receive a preliminary grade before you leave. Your final grade will arrive approximately a month later. If you don’t pass the first time, don’t fear; you can retake it four more times without it being held against you. The median annual salary for vet technicians is $32,490, reports the Bureau of Labor Statistics. Veterinary technicians and technologists can make more if they are working in the research sector. Because most places that take in animals need 24-hour assistance, veterinary technicians many not have a traditional 9-5 Monday through Friday schedule. Job growth is looking awesome for veterinary technicians. It’s expected to grow twenty percent through 2026, which is much faster than most other occupations. You’ll find the most job prospects in rural areas, but there may be some intense competition. Veterinary tech programs are expanding, and more students are entering the courses. There will also be a higher demand for vet techs with organizations that work with foodborne contamination and diseases, and public health. Choosing to be a veterinary technician is a calling. You do it out of a love for animals and a desire to help them. Sure, it can be a stressful, smelly, dirty job, but someone’s got to do it, and you’re the perfect person for it!